Mental Health, Inc. is gripping in the sense that you’ll literally grip the book tightly in both hands as you read this horrifying account of our twisted mental health system. Author Art Levine has tirelessly researched stories of individuals whom our system has failed (or, in many cases, killed, through negligence, overmedication, or both), and he is a crusader on a mission to hold executives and bureaucrats accountable. Over the course of 17 chapters that are loosely organized around vulnerable populations (kids; seniors; veterans; inmates) and later around particularly atrocious dimensions of mental health “treatment” (abuse and torture; profits for the private-equity firm Bain Capital), the reader learns again and again that, when it comes to the way we care for the mentally ill, everything is wrong. The principal source of that wrongness is the drive for profit that has shaped U.S. health care. Levine portrays a system in which pharmaceutical companies engineer new drugs, specify the drugs’ efficacy with scant or problematic data from clinical trials, and then obtain approval from the FDA—an agency manned by regulators who may double as paid promoters for those selfsame pharmaceutical companies. Then billions of taxpayer dollars from programs such as Medicaid are released to cover the cost of feeding those drugs to the mentally ill (broadly defined), including children as young as five. Prior to picking up this book, many readers will have assumed that a drug must have demonstrated therapeutic value to be prescribed for a particular disorder. But Mental Health, Inc. shows that evidence of a drug’s efficacy can be dubious or outright nonexistent, and the drug can have dangerous side effects, and none of that will necessarily prevent prominent physicians—who are also frequently paid off by the pharmaceutical industry—from prescribing it in astonishing quantities. In an especially tragic episode, Levine tells the story of Andrew White, a young veteran with post-traumatic stress disorder who repeatedly sought care from the VA. Instead of counseling or a compassionate ear, White received increasing doses of a drug cocktail that included Seroquel, an antipsychotic that can cause cardiac failure. Although Seroquel has never been proven effective as a treatment for PTSD, the VA prescribes it widely as such, at taxpayer expense. Levine makes it clear that the VA is fatally inept. But he also says that the care veterans receive is far better than what’s available for the civilian population. Indeed, when it comes to civilians, the single largest facility for holding mentally ill people in the country is the L.A. County jail. 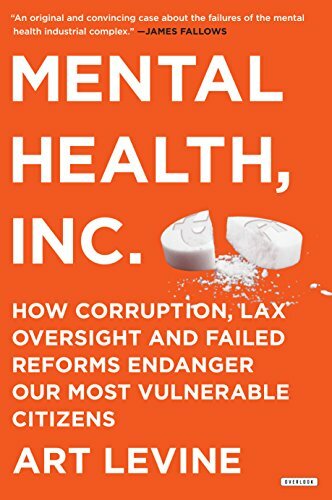 The broader mental-health system is so horrifically bad, in fact, that Levine struggled to jam it all into this book. In his evident passion for the subject, he spent so much time telling victims’ stories that he mostly forgot to provide essential background. From the first page, the book throws the reader into a shocking vignette about our failed system—an effective opener, to be sure, but Levine never steps back to provide real context. This pattern continues throughout the book. He tells numerous stories of over-drugged schizophrenics who ultimately experience terrible psychotic breakdowns, but he leaves it up to the reader to sort out whether the breakdowns are the result of the drugs or the initial mental illness. Fifteen chapters later, when he discusses treatment regimens that actually work, he finally offers a bit of useful background on schizophrenia. When it comes to solutions, Levine shows that principled physicians and therapists, who refuse to be bribed by drug companies, have developed some promising programs. Schizophrenics who participate in compassionate group therapy, which offers them a chance to connect with others and see that they’re not alone, are more likely to experience improvements, as are those who access rare job-counseling services that help them find appropriate employment. (“The best mental health treatment in the world is a job,” a psychiatric expert from Dartmouth told Levine.) For vets suffering from PTSD, strategies that make a real difference include connecting with loved ones and other vets, as well as stress-management practices like meditation, controlled breathing, and exercise. Of course, leaders in healthcare and government are not pushing to implement (or even to pilot) such reforms on a wide scale. The reason isn’t the cost. On the contrary, prescription drugs are the more expensive recourse, both in their direct price tag and because they are often used as the sole treatment for patients who need much more; with nowhere to turn, the mentally ill end up in emergency rooms and in prison, at great expense in dollars and human life. If we instead reoriented our system toward compassionate counseling, taxpayers would save billions, and many patients could get their lives back. But our mental-health system isn’t moving away from its overreliance on prescription drugs anytime soon. The reason is simple: doing so wouldn’t produce much in the way of profits for Mental Health, Incorporated. Mattea Kramer is author of A People's Guide to the Federal Budget. Her expertise includes such topics as public sector finance and health care costs.